during one of my scans I noticed that the level I mounted above matterport device changed level (the bubble) while the device was spinning. No one has never noticed this? I have noticed this as well and I agree that it's probably the cause for alignment issues. I'm believe it has to do with the fact the the mount for the camera is offset, so more weight is on one side. I have not noticed this. I do double-check both the quick release and center pole for tightest on full-day shoots. @CarlosFHdz I do check the level before each scan. I rotate the camera to check the level in a second direction which may account for why your level ... is not level. Maybe it is just hopeful thinking by me, but my impression is that my models process faster and fewer alignment issues. This is an interesting point. I know that this has been reported for Google Business View Photographers with certain pano heads and Google allows for a slight variation in leveling so in most cases it was not an issue. In regards to the MP camera. I tend to first level my Manfrotto tripod with the built in level and then check the level of my camera with a spot bubble level on a full manual rotation. This seems to work for me. In regards to fine railings I think this will always be a problem and your clients will just have to accept that this is a VT not a high quality photo shoot. @DanSmigrod , put the level on the camera and watch it while it turns. I think you will notice the same variation that @pierobortolot and I experience. If you don't let me know, because this might be a case of some bad cameras. Is the level changing while it's spinning? How about once it stops spinning? I use round level bubble that I have affixed to the top of my camera. Placement of the bubble is not centered on the top for best results. Also I utilize a survey tripod that I have adapted with a steel plate. The quick adjust levers are easier to work with and can be tuned. Also its a larger tripod with no central limits, offers more versatile setup positions. Besides that this camera overall is not mechanically refined, it is not calibrated like a survey instrument. You see this in the enclosure wobble in rotation. That said based on the mystery of many things Matterport technology it is entirely likely that this wobble may be perhaps by design. If you rotate a total station for example and the level bubble goes out in the same way that it does with this pro camera its time to take it to the shop for calibration. If you are going for accuracy (i am) you can do some things to mitigate this issue but not entirely. 1. watch the bubble drift, watch it many times, until you get a feel for how the axis wobbles I put a piece of tape on my camera so that I know to tune a little bit one leg to split the wobble a little. 2. Use your level on the tripod first, with a survey tripod its a big flat plate at the top this is an easy task, then mount the instrument. ultimately there will be a mathematical error (or visually - Distortion) when it is time to align the image and pattern data set from each stop. I issued this problem to MP support team and they answered that the problem should be related to tripod or the mount. Since tripod is a Manfrotto top-of-the-gamma and mount is well tighten I do believe it's a problem of the matterport. Guess if they sold some devices with these imperfections... It would be a boomerang. I have seen the issue but again never noticed a large impact on scans. The problem with placing a level on top is getting right over the center axis of the rotation spindle. I use a ninja three point leveler under the unit which adds one more feature and a two axis level on top, but simalar to a total station everything needs to run thru the center axis for leveling. I also check level on two axis each time I run it. @vincent photo of survey tripod? @ron0987 phot of Ninja three point leveler? 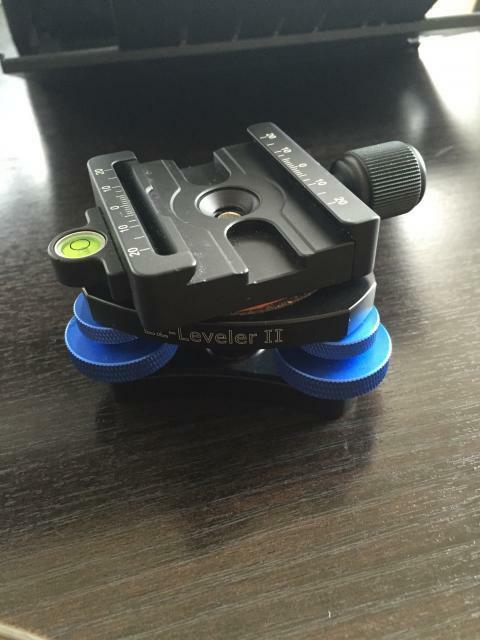 This is the Nodal Ninja Leveler that I use and makes it extremely easy to level on each shot. Thanks for the idea of the Nodal Ninja Leveler, Ron. 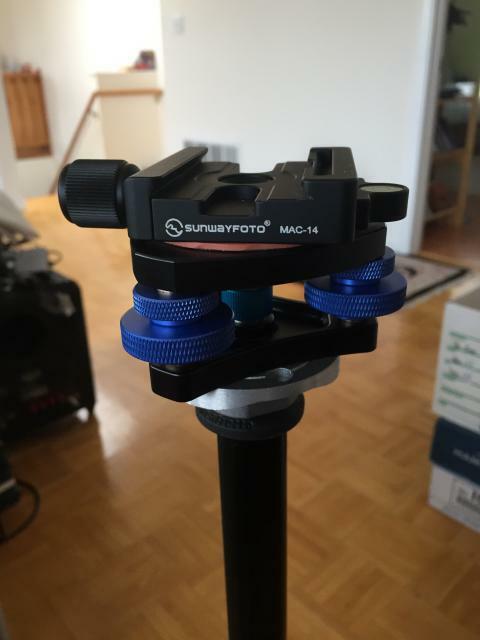 I received it and modified it to the quick release clamp on the Sunway. Can you describe the modification? From your photo, it looks like it simply goes between the quick release clamp and tripod. I use this quick release. Since I use a bubble level on the camera, seems like @ron8967 's solution would be much better,messier and less stressful on the tripod by using the wheels to do the adjustment rather that adjusting the tripod legs. The quick release clamp needed to be disassembled due to the turn knob interfering. Sunway uses a tamper proof torx screw from disassembling. Between the nodal ninja leveler and the Sunway is a 1/8" thick rubber pad I bought at a hardware store. 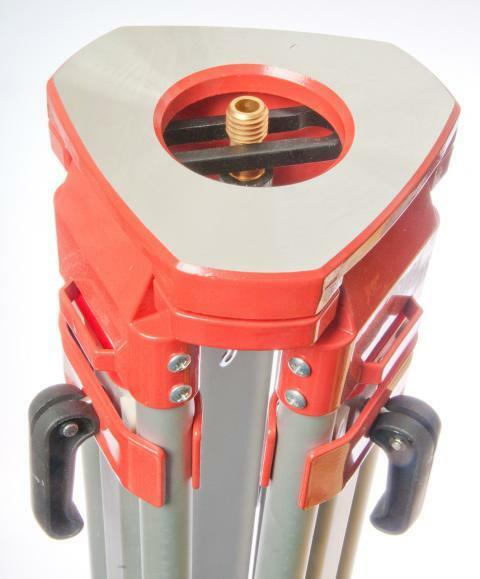 It's to make a shim height and prevent a metal-to-metal contact. The final hurdle is to align the two in a staggered position and fasten all of the screws to set them in place. We can work something out if you want me to do the modification. @DougTse thank you for the detailed notes on this. 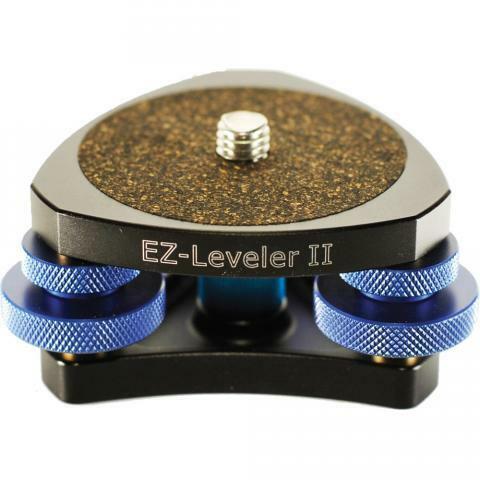 Since @Bill sells Nodal Ninja products, perhaps he can comment on how else the EZ-Leveler II might be used with a quick release plate without the need for modification or to suggest to the manufacturer to offer a solution that does not require this modification (maybe even created as one piece). We actually put the quick release below the adjusting device, so it stays attached to the camera when we pull it off of the tripod. @ccctucker sounds like that a solution for the 1st generation Matterport cameras. The second generation (no name change) has 1/2 of the quick-release integrated with the camera. So can someone attach a photo of the new setup. I was wondering what the fuss was but new mount explains the issue.